Leaving a gift in your will to UNICEF is a special and personal decision that will make the world a safer place for future generations of children. While many charities adopt the straight-forward ‘leave a gift in your will to us’ strategy, we wanted to take a softer approach and introduce the concept of legacy giving to a new audience by taking them on a personal journey (or in this case, a trip down memory lane), encouraging them to consider the world they grew up in and the legacy they can leave behind. With creative partners Open & DTV, we created a catalogue of bespoke video content that enabled people to take a nostalgic look back through the decades and share a personalised montage on social media. The timeline highlighted key moments that shaped their childhoods, as well as important milestones for UNICEF and the immense progress they have made in protecting the world’s children. 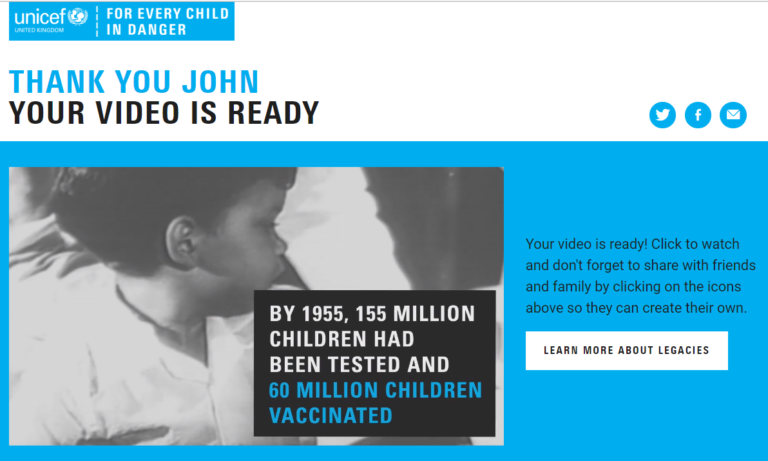 Once users interacted with the timeline, we re-targeted them with more direct, guide-focused messaging asking them to help UNICEF protect tomorrow’s children. The results speak for themselves; we smashed 2017’s original unique lead target by 260%, CPA fell 71% and UNICEF’s conversion rate increased by 703% YoY. © The Kite Factory. All Rights Reserved.